Our new A-Z How to Weed Guide is your quick reference guide to finding our garden maintenance articles on specific types of garden weeds, ways to turn chores into games for kids, methods to make garden work easier, and materials and tools that work — or don’t — for weeding. 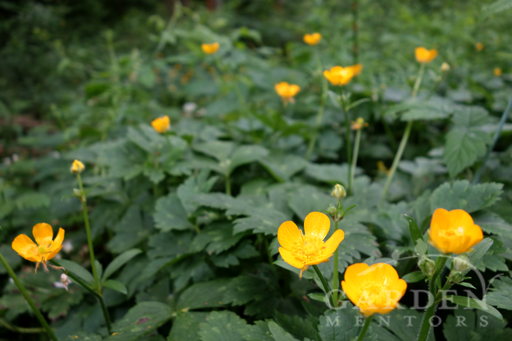 Buttercup weed – a creeper that loves wet feet in sun or shade. Be sure to bookmark this page and visit often. As we write more guides, we’ll post the links here to make it easy for you to find what you’re looking for! If you need help with a weed you don’t see here, let us know in the comments below, and we’ll do our best to help. Bindweed: This garden strangler, also known as Morning Glory weed, may be one you’ll fight for a lifetime. Try our tips to make it go as easy as possible. *NEW* Blackberries: Learn tips to keep these at bay by harvesting delicious berries & more. Plus, a tasty dessert recipe! Buttercup:In sun or shade, this traveler loves soggy soil. Try our tips to beat it back. Dandelion: Is it a weed or a delicious edible? Maybe you think of it as medicinal. Before you rip & tear at it, try our tips for control. Daphne laureola: This Daphne is not only weedy and highly toxic, but it may be designated as one your county, state or federal weed agencies require removing. Dock weed: Whether you know it as dock, Rumex or sorrel, this group of plants is tough. But, once you root it out, there are many ways we’ve shared to use it in your kitchen, garden designs, apothecary, and maybe even your livestock fresh forage. *NEW* English Ivy: If English ivy is everywhere you don’t want it, learn how to beat it back. Fall Seasonal Weeding Tips: In our guest post for Seasonal Wisdom, learn our tips for managing weeds during your fall clean up. Nettles: They’re edible! Try our tips to harvest them before you get stung. Noxious Weeds: What are they & what to do about them. Oxalis: Purple shamrock or clover-like plants spreading fast? Here’s why to remove them. Poison Hemlock: This big beauty is one NOT to eat. Learn why you want to get rid of it. Shotweed: This pretty little weed is easy to pull. Just get it early before it sets seed. Weed Barrier: Sure, it sounds like a good idea…something to block weeds. But, is it really helpful or just a waste of money? Yellow Archangel: This one’s more of a devil in the dark than any kind of angel. Known also as Lamium, it’s no lamb! ZZZZZ: If you’ve eradicated all these weeds, go take a nap! I am new to Seattle by two years. Retired. Bought a neglected 1938 house and yard. Wonderful specimen trees but the rest was a mess. I have a super-invasive week called ARUM. It is taking over many parts of my garden/yard. No one (Master Gardners; Swansons; SKY nursery, etc) seems to know what to do with it or for it. I need help. Any information or advice will be appreciated. Rene, Thanks for writing in. Arum reproduces underground via tubers and by seed. You can begin by digging out patches of the tubers. If you don’t get all the tubers up, it will continue to grow and spread underground, so keep an eye out for new sprouts in areas where you worked to dig it out. If more sprout, dig again. Do not let it form green top growth, which is how it will feed itself and continue its life cycle.